The brief was to create a concept of a mobile solution to share material for front-end sales, using success stories, news, sales material and sales arguments. Through an extensive background research with ABB employees and a customer, we started to understand the current context. The first experience goal set for the outcome is to encourage personal growth, a feeling of progress and improvement that will keep the salesperson motivated to make the best in his job. The second is to bring the feeling of belonging, so that cohesion and unity would be more present inside ABB and encourage an active and collaborative way of working between different departments . The third goal is an attentive interaction, to keep in mind the human part in the sales process, and being open and really available for the customer and their needs. 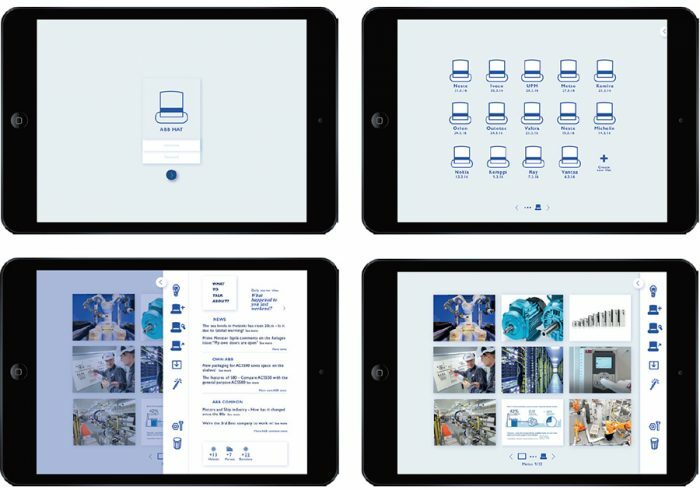 The applicable concept ABB Hat is a mobile app on tablet that helps the salespersons to prepare for their meeting by making it easy to collect together previous presentations, technical data files, catalogues, manuals and pictures to create a customized set of documents for each customer meeting. Product managers have access to the data, that shows which documents have been used the most, so that they can adapt the sales material to what salespersons really need. A newsfeed in the app provides ABB products news, and some ideas of everyday things that can be discussed with the customer and start up with, to remember the human part of the meeting. There is also a searching system for the previous cases/case notes, updated by product managers. Since ACS580 is a standard product, the previous applications of the product are a useful way to explain its possibilities to the wholesalers and to their customers. The radical concept ABB Trick aims to open an easy and effective communication channel between ABB employees. Trick is a button that salespersons can set anywhere they like, so that they are reminded to give quick feedbacks about customers meeting by just pressing the button and recording a voice message.The system will translate the message into text and product managers can easily go through the notes from salespersons. Product managers are able to leave Thank you -comments to express their gratitude, and even to start an interaction with the sales, to ask about different specific points. The trick activities of each salesperson are visible and can be measured with the number of voice records and the number of thanks the salespersons get. The activities define a status that gives the salesperson the feeling of improving.